When you live in SoCal you get used to the weather guessers predicting rain, knowing that about 50% of the time you will not get the forecast rain. On the other hand, if they predict wind you usually get that in spades. Tuesday we got it all.......cold, rain and then for good measure wind. 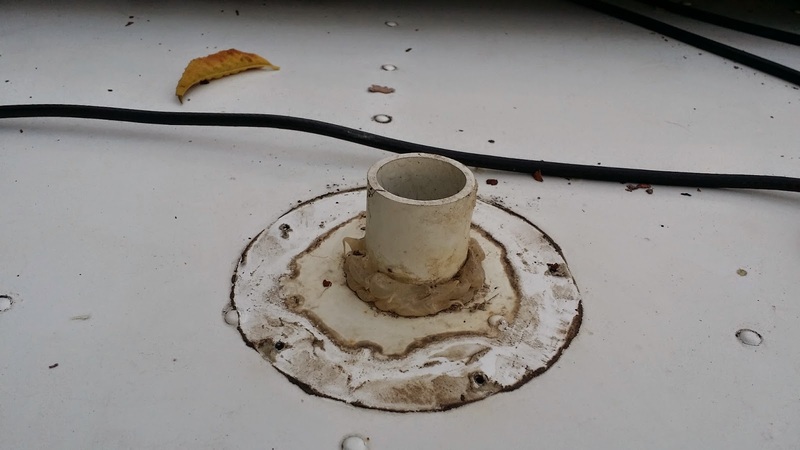 When I left off yesterday I needed to install the new holding tank vent cap before the rain came, so that necessitated me being outside where it is cold very early. Fortunately the install went smoothly and only took about 5 minutes. New holding tank vent installed! After that it was a race to see if I could get the hose 'snaked' under the house to the basement cleanout before the rain came. The distance from the outside of the house to the basement under the house is about 24 feet. In order to 'snake' the hose under the raised foundation I needed to combine 4 different poles together with duct tape, then duct tape the end of the hose to one end and then push it through a 'vent' opening to the basement. I ended up using 24' of the 26' foot pole, but it worked, and now we are able to use our macerator pump to empty out black tank into the cleanout. Around 5 we went into the house to have dinner with Kate, Nick and the kids. It was pretty cool to sit around the Duncan Phyfe dinning room table we gifted to Kate along with a lot other stuff from our 'sticks and bricks' home when we became nomadic, listening to an old Frank Sinatra LP ('Long Play' vinyl record....'Old Blue Eyes Is Back') that we also gifted to Kate along with a large box of vintage LP's. We enjoyed a great shredded beef chile with a side of great conversation. By the time we made our way back to our coach the wind had come up, but it only got up to about 20-22 mph, so not bad by 'Santa Ana' standards. We spent the evening watching 'Monuments Men' that I had recorded off of 'Starz' on DirecTV a few weeks ago. That was our 2nd Saturday (Tuesday)......thanks for stopping by! Project 1 - I noticed while I was up on the roof tilting the solar panels in Ventura that the holding tank vent cap was missing. It appears there was some corrosion over the last 33 years, and eventually it just came off in the wind. As soon as I discovered it I began looking online for a replacement, and quickly found an exact replacement on eBay, and ordered it. It arrived at my son's office the day after Christmas, so I decided Monday it was time to run into the office and pick it up. 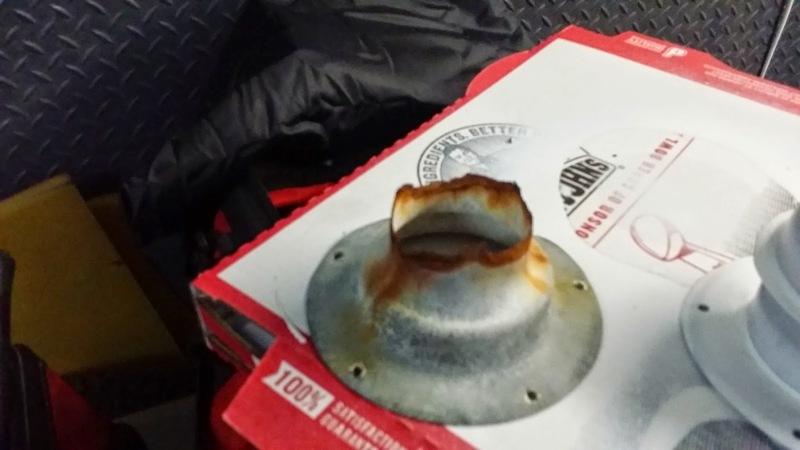 The replacement part is galvanized metal, just like the original, and I knew I would have to paint it. 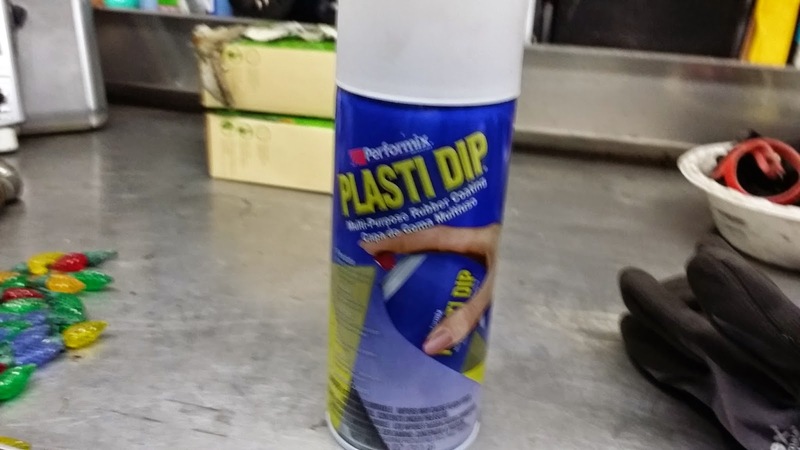 My son, Chris, suggested I use a product called "Plasti Dip"....a spray on type of vinyl coating, so I picked up a can of it on the way home. The 'naked' vent pipe that must be covered! 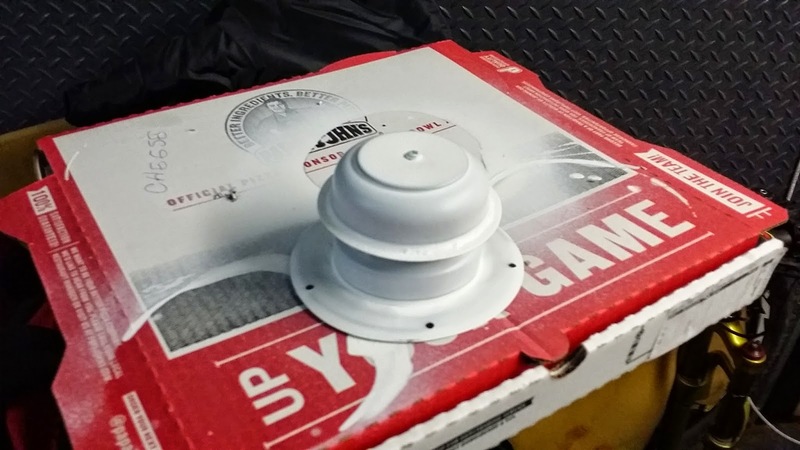 New vent cap with "Plasti Dip" applied.....good stuff! As you can see from the pictures, the vent pipe needs a cover, or rain and debris will go down the pipe.....not good. The "Plasti Dip" takes about 4 hours to dry, so I will be installing it on Tuesday, hopefully before the rain comes.....if it comes....this is SoCal after all. 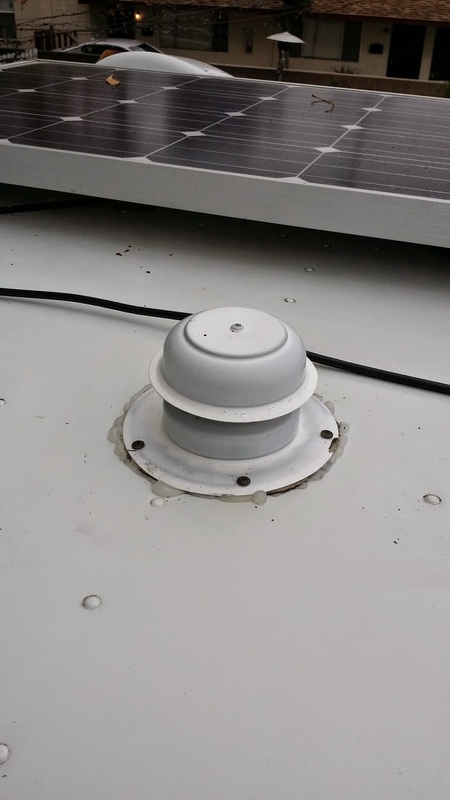 There are five holes on the old vent cap, and on the new vent cap, and they are identically placed, so I will not have to drill any new holes in the roof to mount the new one. Project 2 - We are using my daughter's WiFi while we are here. They have a Netgear Wireless Router that has seen better days, and it needs to be re-booted several times a day. TLE and I decided that we would gift them a new router, so I stopped off at Best Buy to check out their WiFi router options, and settled on a Belkin Dual Band Router. Nick installed it when he got home, and it works great! Lightning fast, and better range.....plus it does not need to be re-booted every 4 hours. Project 3 - The sewer 'cleanout' here is in the basement. In order for us to dispose of the waste in our 'black tank' once a week I need access to that 'cleanout'. First I needed to fix up a 'riser' to bring the connection up a couple of feet. That involved reducing the threaded opening from 4" to 3" so I can connect easily with my equipment, and leave it hooked up while we are here. So, Home Depot was my next stop where I picked up some black ABS fittings and a 2 foot piece of black ABS pipe to act as the 'riser'. I'll take care of installing that on Tuesday also. Project 4 - As you may recall, when we received our new DirecTV DVR receiver we had to connect it to our front TV via an HDMI cable, since there is no longer a coaxial cable 'output'. As a result we will have to run an HDMI cable to the bedroom TV, and another down to the 'basement' for the outdoor TV. I spent about an hour online ordering (through Monoprice) an HDMI switch box, and the necessary lengths of HDMI cabling.....thank you to the several people who suggested I use them for this cabling....their prices are significantly lower than Best Buy, or even Amazon. For the TV in the trailer I'm going to use a wireless setup, which is quite expensive at $200 for a transmitter and receiver. Initially I was going to get one for each TV, but the cost is a little steep for my pocket book. The transmitter/receiver are good up to 150'......the TV in the trailer is less than 50' from where the transmitter will be placed. Of course, now I am going to have to buy two new TV's that are HDMI compatible, but the smaller flat screen TV's nowadays are quite inexpensive. I have located two that will fit the bill, and will buy them as soon as I receive the new HDMI cables. That was pretty much First Saturday.......thanks for stopping by! Sunday was week 17 in the NFL......a number of teams were out of it and were playing for nothing, but several teams were playing for something and at 10 am I was in my recliner ready to watch them all, and watch them all 'we' did.....yes, TLE was there with me watching most of the 5 games that were televised. It was cold outside all day, so staying inside to watch football was not a difficult choice. It will be even colder for the next week, but, of course, 'colder' is a relative term. We are not getting the 'artic blast' they are getting in the midwest....our low temps are in the low 40's, and high 30's.....not exactly frigid, huh? In spite of the cold weather, the skies were mostly clear, and it was a nice day overall. Most importantly, my Denver Broncos won their final game against the Oakland Raiders 47-14 giving them a 'by' next week, meaning they have 2 weeks off before they have to play again which will give several guys a chance to heal up for the playoff run. I had TLE total up our mileage for 2014 as we are now done moving until after the New Year. Our total mileage of 5,118 surprised me since we didn't begin rolling our tires in 2014 until March 4th, and then sat in one place from May 17th until September 2nd, and then from September 3rd until October 31st, then once again from November 2nd to December 19th.....we spent 83 days traveling....wait, what? So, basically, we covered 5,118 miles in 83 days, and sat in one place for 282 days. I'm a little concerned about having my 'nomad card' revoked for lack of movement......lol! It was a different year for us this year, but it is exactly the kind of year we wanted, and needed. We accomplished a lot in our 82 days of travels, and saw a lot. We were able to spend a lot of quality time with nomad friends during the year, and spend a lot of time in places we truly loved. In fact, in 2015 we will return to South Lake Tahoe for the summer, and to Cape Blanco for the month of September. Otherwise we will be changing our view on a pretty regular basis. Around 5 TLE got out a couple of Ahi steaks for me to grill, and she added spinach and a fruit salad as sides. Those Ahi steaks were just amazing! We closed out the evening watching Sunday night football, and then the 'Mentalist' and 'CSI'. You can only imagine how sweet it is for me to write the last two blog titles. 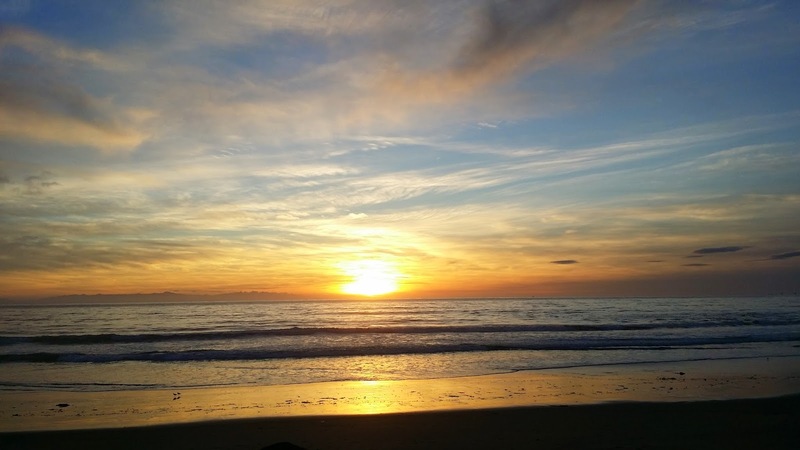 It has been a while since I wrote about how every day feels like Saturday when you're retired.....when you're no longer subject to schedules promulgated by someone else. You remember, I'm sure, how on occasion you would wake up Saturday morning thinking it was a work day for a few seconds, and then realize it was Saturday.....that was always a great feeling for me when I realized I didn't have to jump out of bed and get ready for work. For those who might be new to this blog Monday is now first Saturday, Tuesday is second Saturday, and so forth. Saturday is real Saturday, and Sunday is, well, just Sunday.....so there are 6 Saturdays in my week now, and one Sunday. After continuing our set up for a couple of hours Saturday (deploying patio furniture, lights, raking up leaves, etc.) I decided it was time to take a bike ride to the top of Mt. Rubidoux. The summit of Mt. 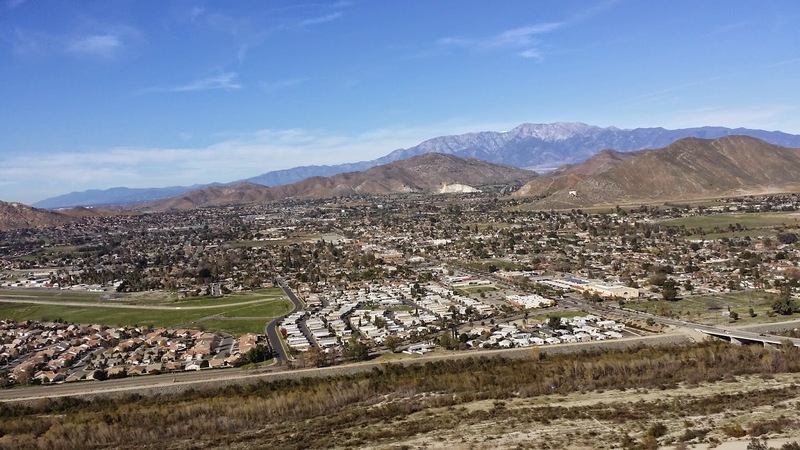 Rubidoux sits at 1,339 feet above sea level. From our elevation of 580' above sea level it is a 559' elevation gain to the top, which makes for a good training ride. With mostly clear skies the view was beautiful! 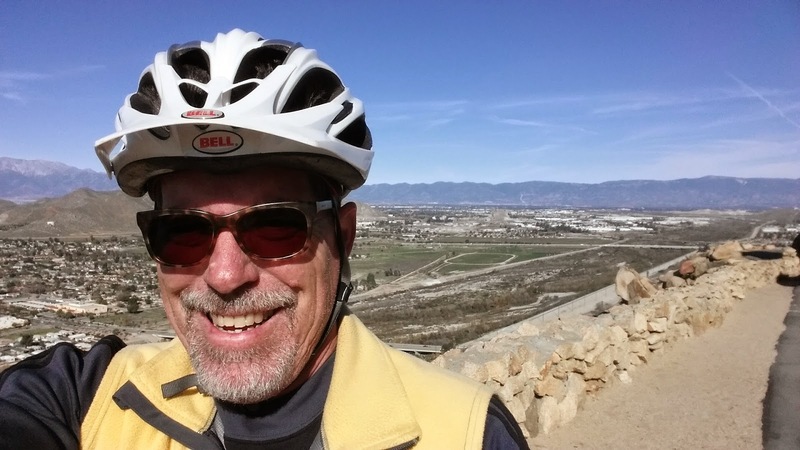 After descending from the top I picked up the SART (Santa Ana River Trail) bike path and took it north into Fairmont Park where I rode around the lake, and then back 'home'. In all I covered 10 miles in one hour, and it was a perfect first ride. Around 1 pm people from Nick's side of the family began to arrive for a pizza party, and we spent the rest of the afternoon meeting new people, and getting re-acquainted with others. TLE and I gave half a dozen tours of the coach to those who were interested. The party went on until almost 9 pm, but we called it a night about 6 pm....it was getting cold outside in spite of the outdoor fire, and two propane heaters, and besides that the Holiday Bowl was in progress between USC and Nebraska. In fact it will be cold, or what passes for cold in Southern California, for the next 9 days with temp barely breaking 60 a few times, and down into the low 50's with some possible rain thrown in for good measure. So, I watched USC (Trojans) beat Nebraska (Cornhuskers) 45-42 in the "Holiday Bowl".....it was a game that was way more interesting for Trojan fans than it should have been, but unlike a few times earlier this year they hung on to win the game with good defense stops the last few minutes. The game lasted close to 4 hours.....long for a football game. That was Real Saturday........thanks for stopping by! 5th Saturday is Moving Day! Friday our three day stay at Rancho Jurupa Regional Park came to an end, and it was time to move to our permanent site for the next month. Originally our intent had been to come back to Rancho Jurupa for the time we were here and volunteer while staying for free, but they had no volunteer positions open this time around. They did offer us a position at a Riverside County park out in Beaumont, but that would be close to an hour's drive each way, and just not convenient since we will be attending a lot of family functions leading up to Sharon's wedding. As it turns out our middle daughter, Kate, owns a home with a large lot in Riverside, and graciously agreed to have us park in her backyard along the property line. 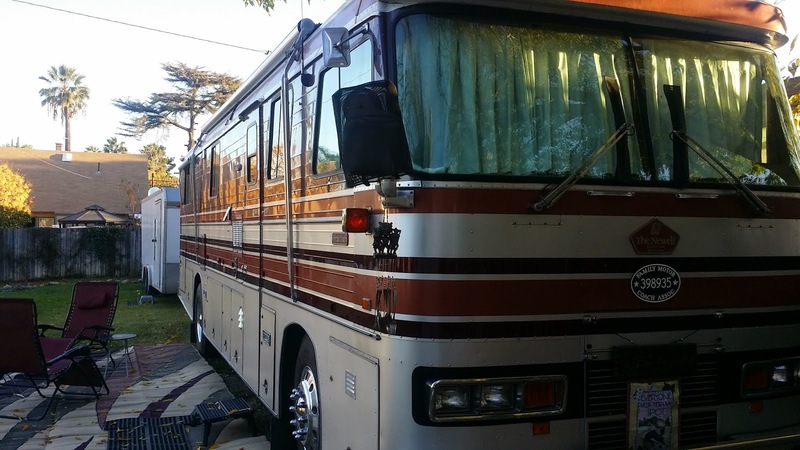 As always, when I am going to park our coach in small quarters I am a little paranoid and need to check everything out to be sure we can not only get 'in', but get 'out' when the time comes. I also bought (on eBay) a 30 amp RV receptacle that my future son-in-law (Nick, who is an electrician) installed so we could have a reliable source of power while are there. We spent the morning getting ready to go, and around 11:45 we began the short trek over to Kate's property. Their driveway is a little narrow at the street, but once you get past the gate the rest of it is about 11-12 feet wide. I parked my 62' feet on the street, dropped the trailer and then pulled forward about 100 feet. My oldest son, Chris, came over with his Chevy pickup and backed our trailer in to the back of the property, and then I backed in the motorhome. It all worked out fine, and we are now safely ensconced in my daughter's backyard. All we have to do when we get ready to leave is hook up the trailer and pull out.....easy peasy, right? Well, we will see eventually, but for now let the festivities begin! It took us the better part of the afternoon to get set up, and 'hooked up'. The coach is in the shadow of a couple of trees which are blocking access to the 'southern sky', so we deployed our Winegard Carryout G-2 satellite, and had TV within a few minutes. We spent some time in the early evening with Kate and her family, and then retired to the coach for the evening. I took a nap in the recliner while TLE watched a few recorded cooking shows, then I watched some episodes of Fraser before heading to bed just after 10....TLE preceded me by at least an hour. Life is good.....thanks for stopping by! The "near and the dear one(s)"....3 generations! So, the circle closes once again......Christmas has come around again, and another year has passed. A year ago I had no great grandkids.....this year I have one. I'm sure I must be getting old, but so far it doesn't feel like it. The past 3 days has been a whirlwind, and I've lost count of all the hugs I have gotten from my kids and grandkids, and I am thankful there are many, many more to come. I was up, regrettably, far too early at 5 am, but it is what is is, and there are always naps to fill in the gaps. We have annual Christmas traditions in our family, and the first one each Christmas is that all the kids, grandkids, and great grandkids arrive at my oldest son's home (Chris) for brunch around 10 am, and then the opening of presents. Chris is a very good chef (that is not his profession), and the food is always to die for. Our second tradition is that TLE and I take the kids to a movie in the afternoon. As the years progress fewer and few kids come as they have other family obligations, and I totally get that. This year Meredith (far left in the picture) and Sharon & Rod (dead center, back row) joined us to watch the 3rd Hobbit movie (The Battle of the Five Armies). The five of us thoroughly enjoyed the movie. Each year I get a head count at brunch, and then purchase our tickets online using Fandango. They send a message to my phone with a special UPC symbol that the ticket taker scans as we enter the theater.....no muss, no fuss....easy peasy.....and it was. We met out front at just after 4 pm, and were in our seats by 4:05 pm....no ticket lines, and no paper tickets to clutter our pockets later. 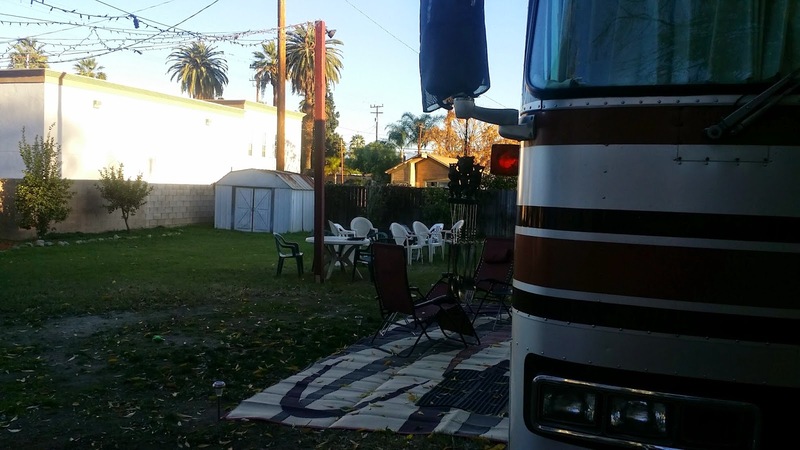 Friday we will be moving our 62' over to my daughter's property for the remainder of our stay in SoCal. My oldest son, Chris, will come down with his pickup truck and help me back our trailer into the backyard, then I will back in the coach. "Another year over, and a new one just begun....."....and so that was Christmas......Thanks for stopping by! I'm back to waking up too early......4 am is way, way too early to be leaving the warm comfort of one's bed, especially if one is retired. Probably still part of the fallout from living like a vampire for 7 weeks. I managed to stay in bed, though, until just after 5, but finally got up. We had several tasks that needed to be completed before 11 am, so we were out of the coach by 8:30 headed for Rancho Cucamonga. Our tasks? Well, there were a few last minute Xmas presents to acquire, and two of them were gift cards at a place called 'Active', which is a popular California ride/board shop (20 some odd locations).......the Rancho Cucamonga store of 'Active' is where our future son-in-law, Rod, works as manager. He said to be there before 9 am to avoid the Xmas Eve rush, and he was right! We were in and out of the store in 5 minutes. Then it was on to my son's office to pick up a few packages ( as well as TLE's unending supply of Christmas wrapping paper) which I had shipped to him awaiting our return to SoCal, one of them being a Christmas gift, then it was over to 'Best Buy' to get another gift card, and then home. At home I had a few projects to work on while TLE wrapped up all the presents. One of the projects was to put a new bike seat on the mountain bike I bought for my grandson Elijah when he visited us at South Lake Tahoe last summer, as well as tune the bike up for delivery to him Christmas day. I originally had just bought it off Craigslist thinking he would use it while he was visiting us, and then sell it again, but he fell in love with the bike. As a result I've been carrying it around with us since we left SLT. Around 5:15 we drove into Ontario, CA (about 13 miles) to a dinner party at the home of Jack and Nancy, Nick's parents. Nick is the fiancee of my 2nd daughter, Kate. They are slated to have their nuptials in October. We, as always, had a wonderful visiting with them. We were home by 8:30, and I'm pretty sure TLE was in bed by 9. I fell asleep in my recliner watching 'Christmas In Connecticut', one of my favorite Christmas movies......maybe that's why I woke up so early, hmmmmm? So, Christmas Eve is in the books.......next up.....CHRISTMAS DAY! Thanks for stopping by! I know, a little trite, but so true. After almost 3 years on the road it feels so good to come home, if even for a short time. We left Ventura about 9:15 am and were checking into our site at Rancho Jurupa Regional Park about 3 hours later. The drive south involved traffic, more traffic, and way too much traffic. There is no way to avoid it......traffic is the nature of Southern California. None the less, we arrived without any issues except a little more stress than we would have wished for ourselves. Contrary to our normal practice we made reservations for our three stay, which will get us to the day after Christmas when we will move to our daughter's property on the east side of Riverside where we will spend the remainder of our time while in SoCal. Around 6 pm we drove over to our daughter's home to check out the logistics of getting our 62' on to her property, and it looks like it will work out just fine. From there we all convened to 'Salted Pig' for dinner. 'Salted Pig' is one of our favorite brew pubs anywhere in the USA, and as you know we have darkened the doors of a lot of micro breweries/brew pubs over the last few years. The menu is one page, and every single item on that menu is to die for. Fortunately our kids share our love of this place, and 3 of them were able to join us there with their significant others for brews and dinner. Nick (on the right) is engaged to Kate (on the left)....their wedding is in October.......Tim (to my right) is in a serious relationship with Laila...........Rod (last on the right) is engaged to our daughter Sharon (last on the left), and it is for their wedding that we are here right now. We had a lovely time talking and laughing for a couple of hours before it was time to call it a night......but we didn't quite call it a night. We headed back to Kate's home for an outdoor fire until about 9 pm, then headed home. It was a great first day home, and it was great to get a lot of great hugs in the first day back. The weather is scrumptious, and delightful......72 degrees by day, and a low of 52 at night......quite the contrast to our stay in Sparks. My body clock has completed the switch back to non-vampire hours......all it took was three relaxing days at the beach. I was up at 7 am getting the coffee going.....we only dropped from 96% to 85% overnight (which included watching TV for several hours), so I flipped on the inverter to make the coffee, and the gas heaters to warm it up a tad using another 4%. Around 9 I turned on the Honda generator for about an hour until the sun began to hit the solar panels, then turned it off for the rest of the day.....by the end of the day the batteries were back up to 89%. The day sported crystal clear blue skies, and it got warm enough that we had to open all the windows......'S Wonderful (from the 1927 George Gershwin song by the same name)!!! I originally had 'big' plans to ride the bikes into town (about 14 miles round trip), but, ultimately, we decided just to hang out under the patio awning reading, enjoying the view, and taking a long walk on the beach. 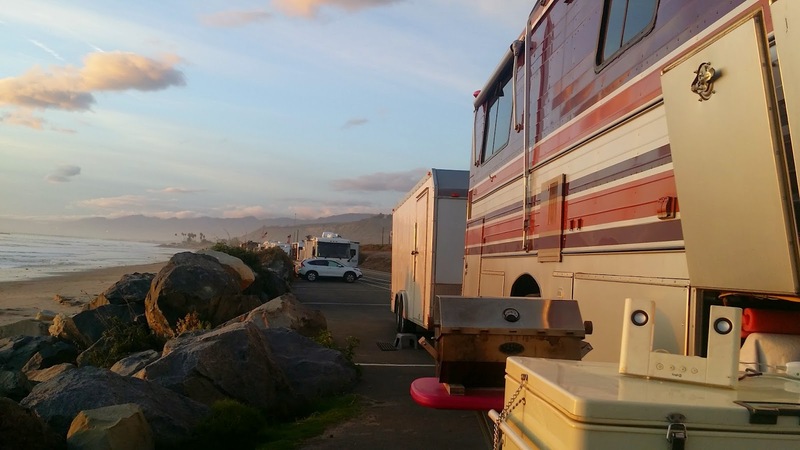 The following two pictures will give you a little more perspective on Rincon Parkway, which is really just a 5 mile section of old Highway 1 that is one of the last places you can park right next to the ocean and camp. There are 127 marked spaces that are each about 50' long, which is why we need two spaces. This stretch is about 1 mile long. 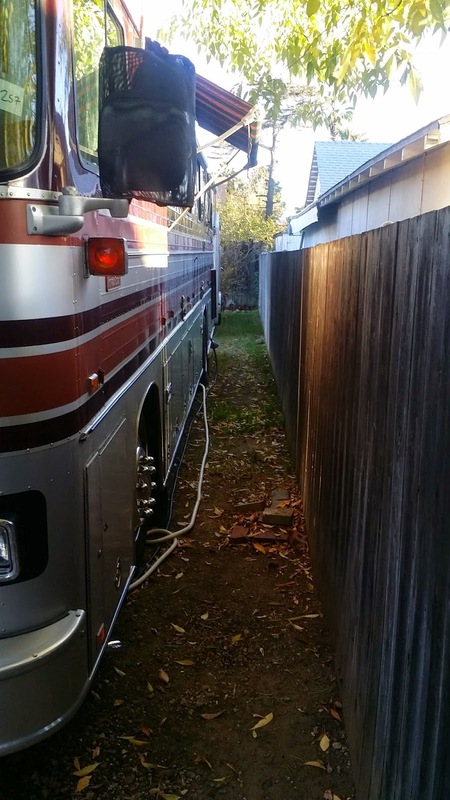 You will have RV's parked in front of you and in back of you, but not on either side. 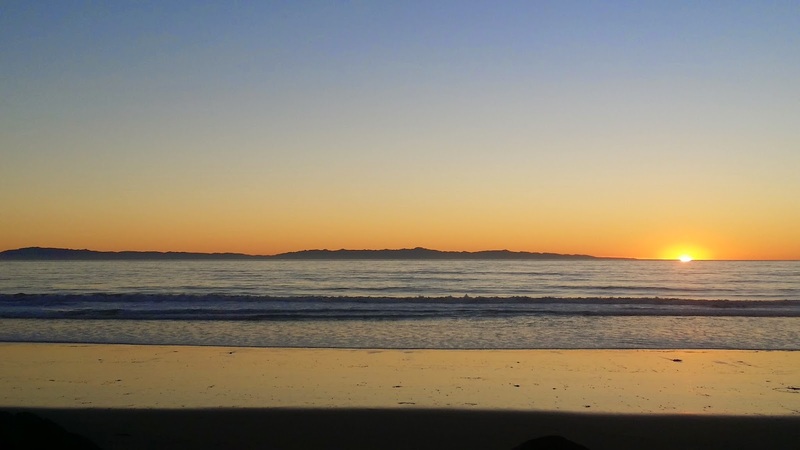 You have an unobstructed view of the Pacific Ocean and the Channel Islands. The sites are all dry camping spots, and pretty much every site has it's own fireplace, although we still use our portable one. There are porta potties every 20 sites, and dumpsters for your trash. Beach access is just a matter of climbing down the rocks to the sand.....the cost is $28/night. From April to October 31st the maximum stay is 5 days, but during the other months you can stay for up to 2 weeks. If you desire hookups there are two county run parks (Faria on the north end of Rincon, and Hobson on the south end) where you can get up to 50 amp electric, water, sewer and pretty good cable TV, as well as showers, restrooms, and an onsite cafe. It's a little pricey at $48/night, but the view is as amazing as Rincon, but with hookups. Some of you may not know it, but the picture of our Newell on the masthead of this blog was taken on Rincon Parkway about 5 years ago. TLE made taco salad for dinner and we ate sitting outside for the first time in months watching the night chase away the daylight one more time. 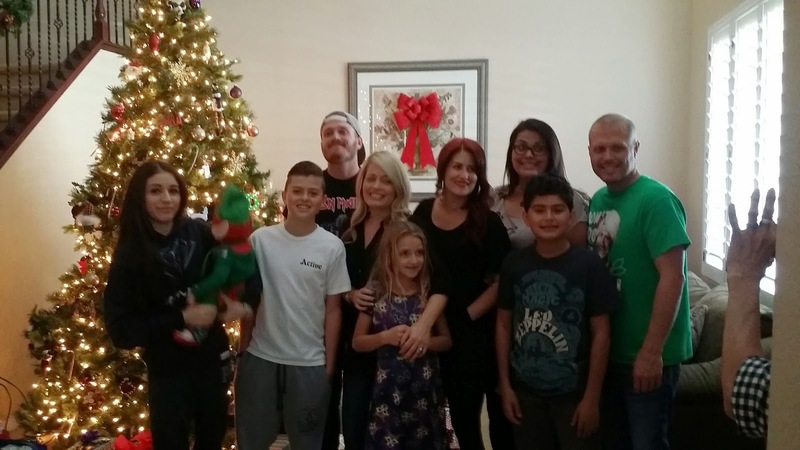 Our time here on Rincon is just about over.....we'll pull up stakes once again and head south to Riverside, CA where we will spend Christmas and New Year's with our kids and grandkids, as well as attend the wedding of our youngest daughter, Sharon on January 17th. We went to bed early Saturday night.....about 9:30.......we were both up just before 8 am.....the sound of the breaking waves all night long did its trick and we slept like babies. We awoke to heavy overcast.....not unusual for this area.......but the air temps were balmy. Our house batteries had dropped to 85% overnight and it didn't look like we were getting any significant sun until around noon so I hooked up our small Honda 1000 watt generator to start throwing some juice back into the batteries until the sun made an appearance. Around 11 I tilted the solar panels in anticipation of the sun coming into play, and by Noon we were getting some serious amps from the solar panels, and were back up to 90%, so I turned off the generator and let the sun do the rest of the work. 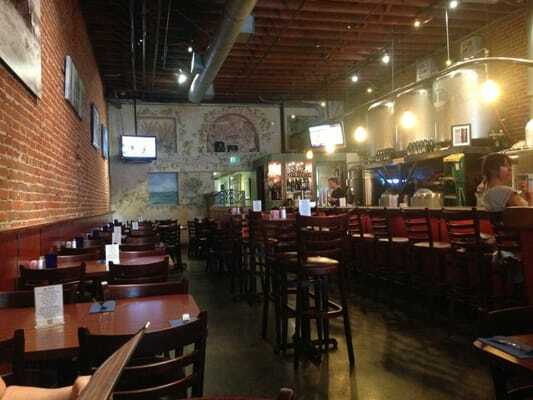 We decided to drive into Ventura for lunch at one of our favorite micro breweries....Anacapa Brewing Company......known affectionately hereabouts as ABC. They have these Sweet Potato Fries with this amazing honey/mustard dipping sauce. TLE ordered the Pumpkin Ale, and for me it was the San Nicholas Stout. We both added a bowl of their Clam Chowder, which is probably the best clam chowder I have had since Tony's in Cedar key. 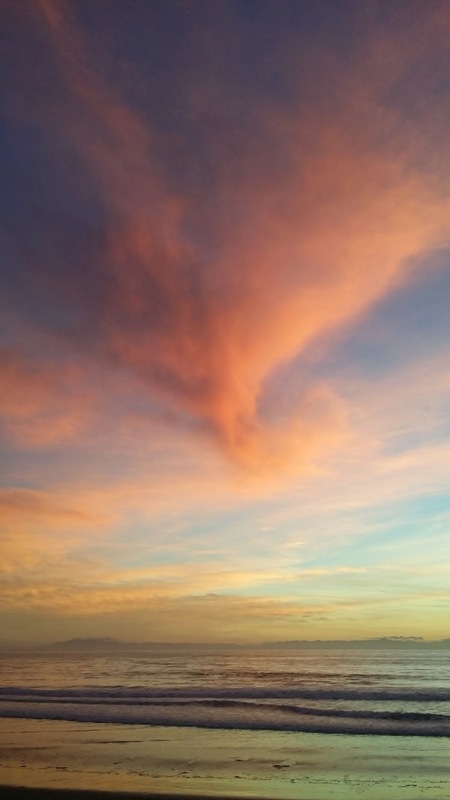 But, I get a little ahead of myself......you know how I write occasionally about serendipitous moments that occur whilst living this nomadic life? Well, Sunday afternoon one of those moments occurred. As we drove down Main Street looking for a spot to park (it's all diagonal pull in parking) it was looking like we might have to park a block, or two away to get a spot.....not too surprising during this holiday season.....but suddenly a spot opened up nearly right in front of ABC and we snagged it......that is not the serendipity I was going to write about, but I think finding the only spot open for 3 blocks was just a touch of serendipity. But wait......Miss Serendipity was not yet done. Just as we exited the car and were trying to figure out how to use the 'pay station' to pay for our spot I hear a woman say "Elaine do you remember me?" We both turned around to see a man and woman looking at us, and the woman repeats the question one more time.......TLE is looking at her intently, and I'm beginning to think this is a case of mistaken identity when TLE suddenly says "BECKY!". TLE and Becky know each other from TLE's workaday life. Becky and Tom Nielsen live in Woodland Hills (about 45 minutes from Ventura) and had decided to drive up to Ventura for the afternoon to browse through some antique shops in search of some Xmas presents......we all arrived at the identical spot in time at the same time....what are the odds? Well they really aren't too long when Miss Serendipity is involved. TLE and Becky spent about 15 minutes catching up while Tom and I talked about RV's.....they own a 19' pop up trailer. ............but it is still true today! Ventura gets its name from the Spanish Mission that was on this site a couple hundred years ago.....Mission Buena Ventura, which means 'good fortune'. It is a typical seaside town, and its Main Street is just loaded with great eateries and interesting shops. It is a great place to park and take a stroll, and that is what we did after lunch. As it happens there is a Goodwill just a block from ABC that we visited....I found a 'new' t-shirt, and TLE found a book she could not live without....total cost...$2.98. We stopped off at the local Von's Supermarket on the way home where TLE bought a great piece of salmon for me to BBQ....while she was in the store I walked across the street to a smoke shop to buy a few cigars (Macanudo Portofinos).....I haven't smoked a good cigar in a few months, and it was time. We headed back to the coach about 2:30 where we spent the rest of the afternoon enjoying the wonderful, partly cloudy weather. I watched portions of a couple of football games, and took a nap while the waves kept coming and coming.......I think I used the word soporific yesterday, and there is no doubt that is the case. The Dallas Cowboys won their game over the visiting Indianapolis Colts 42-7 to clinch a playoff berth for the first time in several years. By the way, the batteries were back up to 96% by the time we got home courtesy of the afternoon sun, and the tilted solar panels......cool! Around 4:30 I headed outside to set up the BBQ and to welcome the sunset......of course a couple fingers of Scotch, and a good cigar were a great pairing for the sunset that followed. TLE made some broccoli and a salad to accompany the BBQ'd salmon, which came out perfectly! I watched the second half of the Seattle Seahawks vs. Arizona Cardinals NFL game, which was won handily by the Seahawks. Another day lived very well......thanks for stopping by! There were no humming conveyor belts, no whirring fans, no 'Baker Carts' Friday night/Saturday morning. No ice on our windshield, NO 30 mile drive 'home' from Fernley. No more living by schedules conjured up by someone else. We are back on 'Hockwald' time.....we are back to Jello calendars; back to changing our view on a regular basis; back to being nomads.....yup, we are just plain BACK! 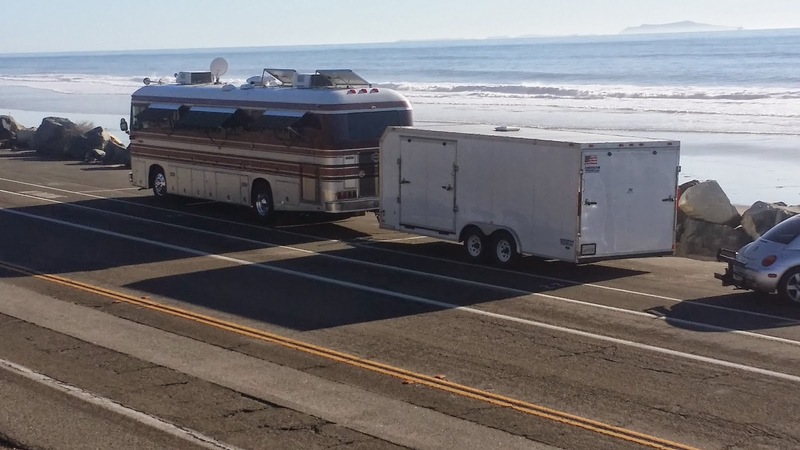 We were up, and rolling our 10 wheels by 9 am southbound and down '395' towards Ventura, CA some 230 miles distant. Traffic was light until we hit Lancaster and Palmdale where we had to dodge some holiday traffic, and then as we neared I-5 the traffic became very intense, and quadrupled as we merged into I-5 northbound.....that 10 miles until we exited on HWY 126 was excruciating, but then it was back to country driving with light traffic. 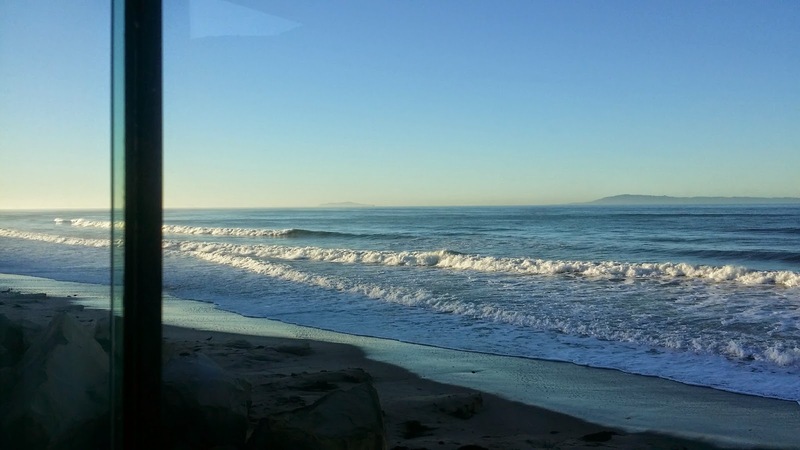 As we passed through Fillmore, and Santa Paula we could feel the balmy coastal air begin to filter into the coach. We turned the heaters off, and breathed deeply. 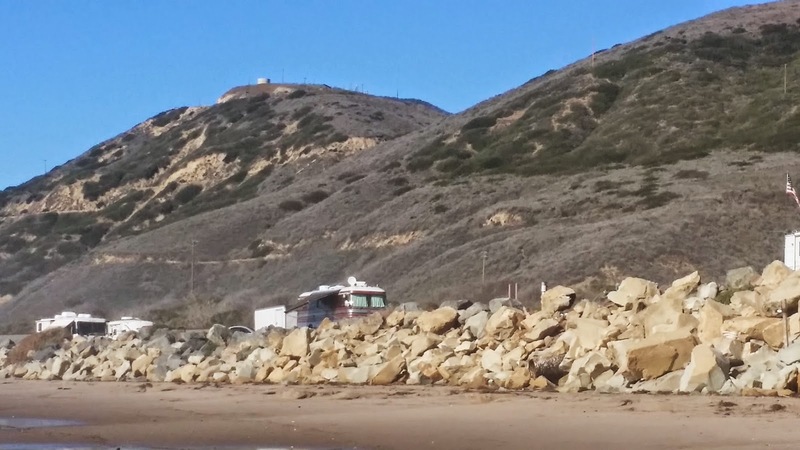 By 1:30 pm we were parked on Rincon Parkway and enjoying the sound of breaking waves just 50 feet away.........breathing in the salt air of the Pacific Ocean once again. I unloaded the portable fireplace, and all the wood from the VW in anticipation of our first evening fire since early October. 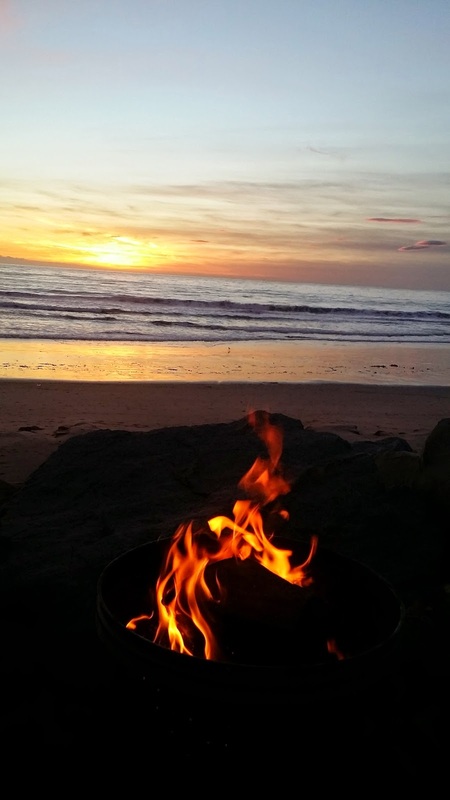 Around 3:30 we took a long walk on the beach as the high tide rolled in, and then around 4:30 we took up our positions by the fire, with Margaritas in hand to watch the sun set, and what a sunset it was! 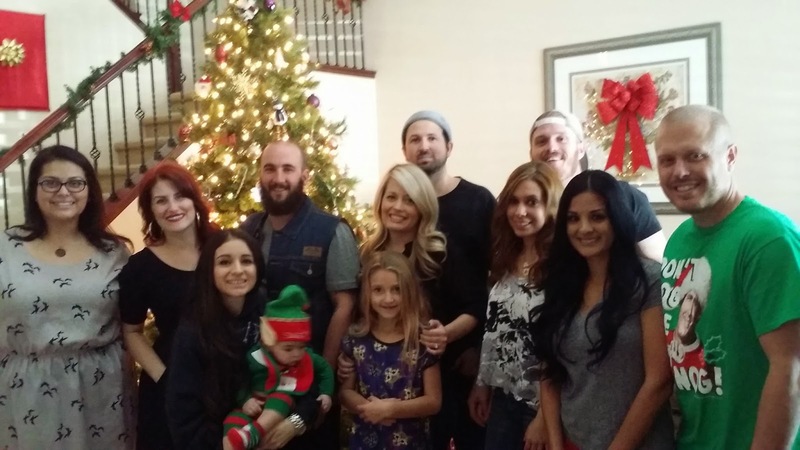 Merry Christmas from the Hockwald's! And there it is.....our first sunset on Rincon Parkway in 3 years.....it's been too long Rincon! 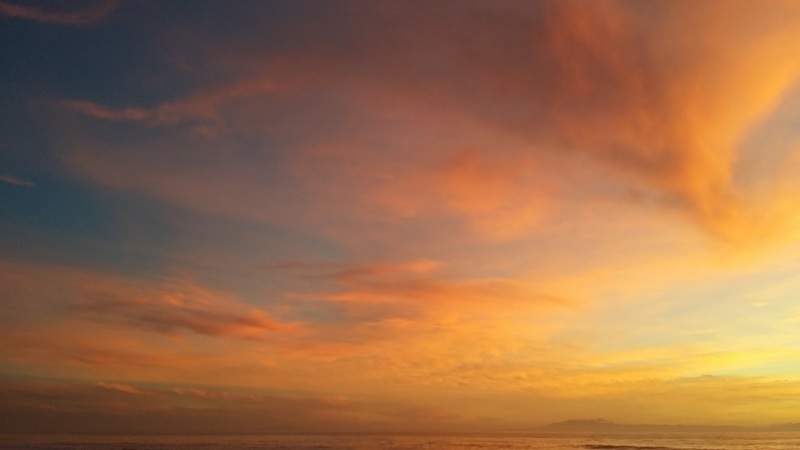 As the night chased away the day we enjoyed a long and spectacular sunset.....no wind....just the soporific sound of the waves breaking on the sand just a few feet away. Life is certainly good, and you would have to work pretty hard to slap the big smiles off our collective faces. Since January 1st we have spent 2.5 months changing our view on a regular basis, and the rest of the time we have spent at 4 fixed locations......Riverside, CA, South Lake Tahoe, Cape Blanco and Sparks, NV. In the last 7 months we have only covered 1600 miles......that is going to change right now! We were up early Friday morning, and on the road by 9:15 am......yep, we were eager to change our view! Our first stop was only 30 miles south of Sparks in Carson City to take on fuel at Eagle Gas on South Carson Street at a cost per gallon of $2.79! We took on just over 75 gallons at a total cost of just over $210......that same fuel would have cost us $300 just a few months ago. As we merged on to I-80 west towards US HWY 395 I, as usual, turned to TLE and said....."It's good to be moving again" and she said "Yeah, it is!". For the next 5+ months we will be doing and saying that a lot. 2014 was a different kind of year in our nomadic wanderings.....we sat in one place a lot, and that was okay.....that was our decision, but 2015 will be a different kind of year, and we are very, very excited about what is in store for us. 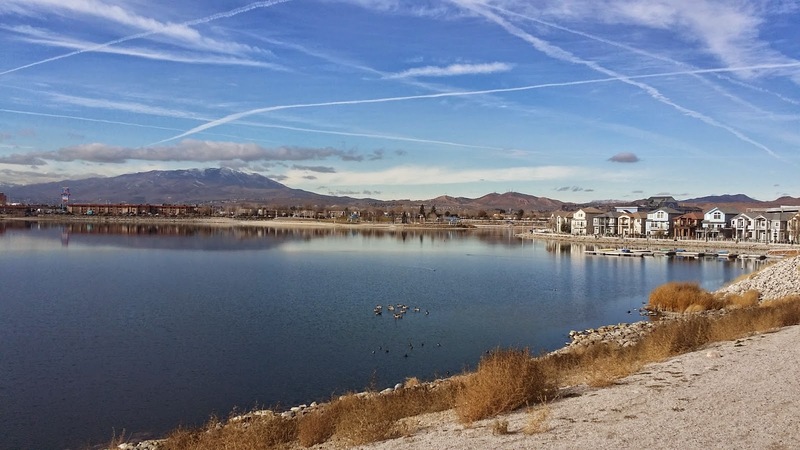 We continued south of US HWY 395 through Gardnerville, Minden, Topaz Lake where we re-entered California once again. The drive south along the eastern edge of the Sierra Nevadas provided frosty views all the way, and we could often see it snowing just to the west of the highway, but never got snow, or rain on us. 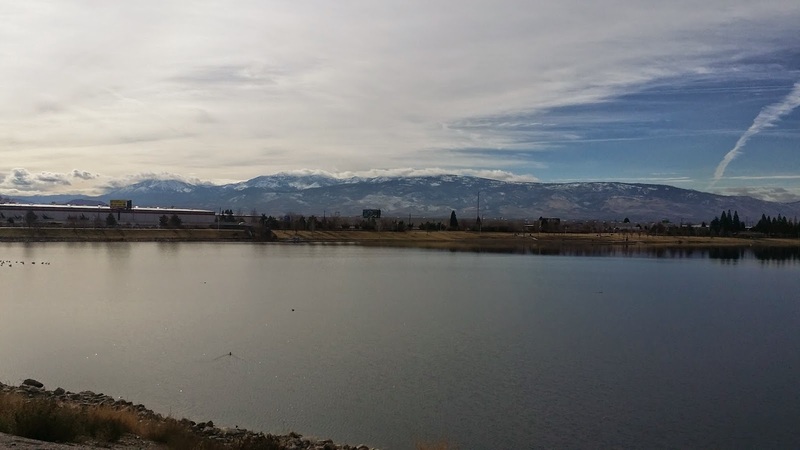 US HWY 395 from Reno, NV south to Riverside is probably our favorite 500 mile drive and we have done it north and south dozens, and dozens of times over our 43 years of marriage. We never get tired of the views, winter, or summer. The thought that we would not drive this route home to SoCal was unthinkable, even though we had initially decided to take I-80 west to I-5 and then south due to the uncertain weather conditions along our preferred route, but a change in our release date, and the good weather window along '395' was too tempting to resist, so we did not. We were not disappointed. While it was quite cold necessitating the continuous use of our chassis heater up front to keep our feet warm, the drive south was spectacular, and most importantly......uneventful. There was snow everywhere except on the highway. The mighty DD 6V92 performed flawlessly as we climbed and descended 6 passes on our way south. We crested Conway Summit at an elevation of 8,128' (the highest elevation point on the entire length of US HWY 395) around 1 pm and stopped at the vista point, as we most always do, to take a picture. We did not, however, go outside to take the picture......it was about 32 degrees! The last big obstacle of the day was descending Sherwin Grade which is an 8 mile section of '395' with a 6% grade. I put the coach in 2nd gear, and 'jaked' down the hill at 33 mph. We were at one of our favorite '395' RV parks (Boulder Creek RV Park) just south of Lone Pine by 3:15.....well before sunset, which was our goal. We have stayed here a dozen times over the years, and for a quick overnight stop it is perfect.....they have all pull through sites, and they are just long enough for our 62'. While there are a bunch of great 'boondocking' spots nearby, with overnight lows down to 30 degrees we opted for 50 amp electric. 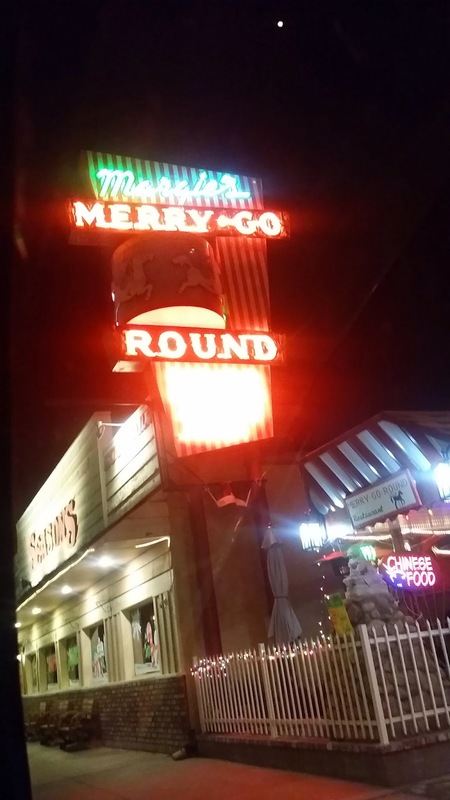 We quickly set up, rolled the Beetle out of the trailer, and drove back into Lone Pine to have dinner at 4:30 at one of my favorite Eastern Sierra restaurants......The Merry Go-Round. It is a fine dining restaurant, and not inexpensive, but I have never been disappointed in the food, or the service. The various rating services give them 4-4.5 stars. Yelp comes in at 4 stars on 97 reviews. We would give them a solid 4.5. Well, what can I say but that it was another day lived well.....we are back to doing what we do best.....changing our view on a regular basis! 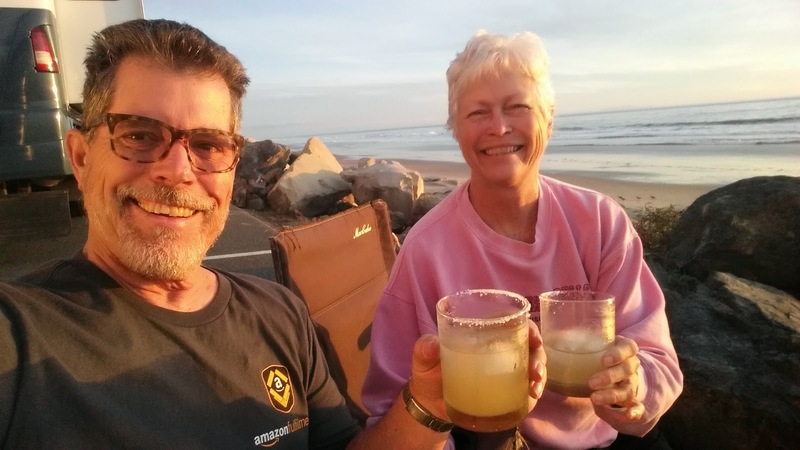 We'll be arriving in Ventura sometime Saturday afternoon for 3 days and nights on the Pacific Ocean.....the day time temps are in the 70's right now with over night lows in the 50's....quite a change from the last 3 months! We watched the finale of "The Amazing Race" and were in bed by 11.....thanks for stopping by! .......what a beautiful day it was for a walk! After we got back from our 3 mile walk we each took care of a few more things in preparation for our Saturday departure.....at least we thought that's what we were doing. We left for Fernley at 5 pm as is our want, and were at the 'Stand Up' area at 6 pm.....all seemed normal....TLE*** and I were assigned to work 'Tranship' where we headed immediately after our stretching exercises. It was just after 8 pm when I finished my second cart and returned to the main area to pick up another cart to find there were none available, and there would be none available......wait, what? That's right, we were officially done for the night after just two hours, and were being offered 'VTO'*.....I didn't see that coming. Jeremy advised it would probably be a similar situation on Friday. We were out the door by 8:30 and on our way home. On our way home I suggested TLE call the 'HR'** folk to see if we could make Thursday night our last night at RNO1. Neither of us saw the point of making another 1 hour round trip drive to Fernley to work for a couple of hours. TLE talked to Becky about 8:50 pm, and by 9:15 (just after we got home) she called back to tell us were were officially released, and would still get our bonus....COOOOOL! We spent the rest of the evening in kind of a giddy state having to rethink all our travel plans......if we were leaving Saturday we were going to head west on I-80, and then south of I-5 as the weather along HWY 395 would be sketchy then, but if we are leaving Friday now the weather west along I-80 is sketchy.....it is snowing along that route right now as I write. Soooo, we have decided to take HWY 395 south from here and overnight in Lone Pine where the elevation is much lower. We will arrive in Ventura Saturday afternoon now, and will have an additional day on the beach.....YAY!! To our friends at RNO1........Julie, Becky, Ken, Kenneth, Barbara, Chuck, Ryan, and anyone else whose name I may have left out......we will miss you. Spending time each night with you all made our time at RNO1 more pleasant. We look forward to seeing many of you along the road as we continue our travels.....safe travels to all of you! Our last 'donut hole' day at RNO1 passed without a whimper......no whimpers, just big smiles. After the passing of Wednesday there are zero donut hole days left in our stint here at RNO1. I was up at Noon.....I know.....only six hours of sleep.....I spent an hour, or so in the trailer finishing up what needs to be done before we leave on Saturday....it is now ready for the VW. As is the case when you don't get up until Noon, it was not long until it was fast approaching sundown again. We decided to go out for dinner, and at TLE's suggestion we headed to O'Cleary's Pub over in the Legends Mall for a few brews, and some good 'pub style' food. As you might guess, we started our evening with a couple of drafts.....for me the Icky IPA, and for TLE the Samuel Adams Winterfest. Every time I tip an Icky I am transported back to late June in South Lake Tahoe when I tasted my first after a great morning of mountain biking with good friends. We then ordered bowls of their Bacon Potato Cheddar soup.....I get weak in the knees just thinking about that bowl of soup this morning....OMG! I should have stopped with the soup, but I couldn't help ordering a plate of their fish tacos (2), and TLE ordered the Platter O'Cleary's....we ended up taking home some of each. As I said, the soup would have sufficed as a meal. From there we worked our way over to Scheel's so TLE could look for some new bicycle shorts......her current pair are getting a little thread bare, and I'll leave it at that. She found a nice pair for $96.....ouch! I really can't complain......the last pair I bought in Tyler, TX back in 2009 cost $89, and they are still going strong. We spent the evening watching the season finales for 'Survivor' and 'Hell's Kitchen'. Natalie won 'Survivor', which is as it should have been....at least based on those who made the final three....if Keith had made it along with Natalie I'm not sure how it would have turned out. We finished with the 'Celebration' around 4:40 pm, headed over to the 'Stand Up' area on the Nevada side for instructions on what we were to do until 6 pm, but, obviously, the night shift supervisors were not on hand yet since the night shift begins at 6 pm, so they had us spend the next hour and twenty minutes doing 'Bin Etiquette'.......this actually was kind of a cool job.....I can't speak for anyone else, but I enjoyed it. Over the course of 6+ weeks I have come across many, many bins that needed serious re-organization, but that takes time, and my job is to 'stow', not fix messy bins. We each took a row in 'Aqua' and spent time pulling everything out of one bin at a time, and then putting it back in so when it is time for the items to be 'picked' the 'pickers' will be able to easily find items for which they are looking. Then it was time for 'Stand Up'......I was assigned to pick in.......wait.....wait......you guessed it.....Utah 7TS.....the first floor. I haven't been on the first floor of Utah for a couple of weeks, so it was enough different that I actually enjoyed my time there. TLE was sent, once again, to 'Tranship' (Blue, 3rd floor). Initially we had been instructed to take our regular break at 10 pm, then our regular lunch at 12:30 am, and so forth, but at 8:52 pm I got a message on my scanner telling all Camperforce folk to take a 10 minute break, and then our regular 15 minute break at 10, so we did.....so two breaks in a little over an hour. Then, just a few minute after returning from our 10 pm break, we got another message at 10:28 pm telling us to take our lunch at 10:30, not 12:30......wait, what? So, there you have it......two breaks, and lunch in a span of 90 minutes. That meant our last stretch before quitting time at 2:30 am was three hours and thirty minutes. TLE joined me shortly after lunch at Utah 7TS as they were out of work in Tranship, and we spent the rest of the evening picking in the same area, which was nice.....we were out the door and in the car on our way home about 2:32 am, and home just after 3 am. After a couple of days of no work you slowly begin to revert to getting up earlier and earlier, and by Monday I was up at 7 am after going to bed at 11 pm Sunday night. The sky was steel gray, and foreboding, and ultimately about 10:30 am it began to snow.........but just for an hour, or so, and by 12:30 it had stopped and the snow that managed to 'stick' was almost gone. While I spent time in the trailer getting things ready for lift off Saturday afternoon, TLE went shopping for some last minute Xmas presents. It was sooooo cold in the trailer that even my little electric heater that normally gets things pretty comfortable in just a few minutes struggled to keep up. I had most of my stuff put away within an hour, and there only remain a few last things, of necessity, to put away before the VW is inserted on Saturday. Monday was our 26th day working at Amazon RNO1. The 30 minute drive to Fernely was uneventful as always. Each night we work, as we approach the Fernley exit, there are two truck stops (Pilot and Love's) that have their fuel prices up in big lights. The prices have been steadily, but quite slowly, coming down. The unleaded had been stuck at $2.65 for about a week, but last night it had dropped to $2.45! Twenty cents since Friday! Diesel is slowly coming down locally.....there are a couple of stations.....not too near us.....that are selling it for $2.99. The local prices are around $3.11. It looks like the station we have used for years near our home in SoCal has already come down to $2.85, and it is as low as $2.77 at other local stations....WOW!!! The amazon work flow assignors changed things up Monday evening.....TLE was sent to Utah 8TS, whilst I was sent to 'Tranship' for the evening. I'm actually coming to enjoy 'Tranship', and had a nice evening stowing there. TLE and I met up in the Utah breakroom for our two 15 minute breaks, and met in the Nevada breakroom for lunch. In 'Tranship' we stowed a ton, or two of various kinds of pet food ranging from bird feed to dog food, and everything in between. Even thought the 'guessers' were predicting temps in the low 20's again, it was only 34 degrees when we exited RNO1.....no frost on the windshield either! We are forecast to have partly cloudy skies the next few days with a chance of precipitation on Friday. Originally it was an 80% certainty it would rain, now just about 30%......that's good for us. No fun driving in the rain, or snow, and it looks like Saturday, our departure day, will be partly cloudy in the afternoon......now all we have to do is get over Donner Summit on I-80 with no snow.....it's only 45 miles to the summit from our location, and then it's all down hill from there. RNO1 - Day 23 - It's official......MOT cancelled!